Founded in 1950, Bocchi has always strived to offer their customers the best quality and innovative solutions at affordable prices. 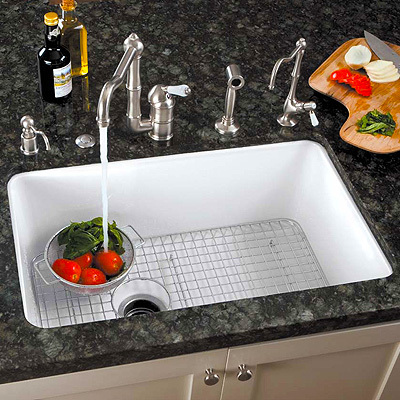 Bocchi kitchen sinks are made from a high-quality fireclay coated in a special glaze, which when fused with the fireclay body, gives the sinks a non-porous, uniform, scratch and stain resistant surface. Choose Vintage Tub & Bath as your source for Bocchi kitchen products and receive free shipping on orders over $50. Don’t see the Bocchi product you’re searching for on our site? Call us today at 877-868-1369 or email us at supply@vintagetub.com. We can special order any bathroom accessory not found on our website.